Hello my stamping friends! Just a quick check in while I have computer access. CHA was wonderful, and I had a great time. Met some amazing and talented people, and can't wait to share more. I WILL do just that if I ever get home. After trying to take an early flight home yesterday, and that flight being diverted to Denver because of the storm in Kansas City, I ended up having to fly back to Los Angeles, and here I will be until I can once again get a flight to Kansas City. I hope those of you who are experiencing this storm are hanging in there, and staying safe and warm. Hopefully I can head home by Thursday, and until then, happy stamping!!! Thanks for checking in. It sure has been quiet here in Peachykeen Land. I will be glad when everyone is home safe and sound! Can't wait to hear all about CHA! I'm glad you are safe, even if you aren't home yet. Sending big hugs & love your way! Thinking happy thoughts for you, Lorie as you wait to get home!! I'm from the KC Metro area. My hubby shoveled for 4.5 hours straight to clear out our not-so-long driveway. The snow drifts where at the same height of our vehicle hoods! Hi Lorie! Hope you are home by now. This weather throughout the country is really causing lots of problems. In the AZ desert we are having abnormally cold temps too. 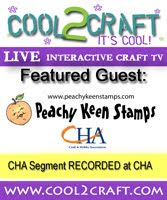 Can't wait to see and hear about your CHA adventures! Hope you are home safe and sound by now!